I have seen Red Diamond wine numerous times at the grocery store but have not tried it until recently. I have been beyond impressed with the Red Diamond wines I have tried so far. At this price point, they would make a perfect fathers day gift that doesn't break the budget. Red Diamond Malbec has a stunning red berry aroma with concentrated flavors of pomegranate and ripe berries are complemented by hints of vanilla on the long, balanced finish. Pairing: Argentine cuisine such as grilled steak, sausage and beef ribs from the asado. Pizza and French cuisine is also a good match. This crisp Pinot Noir is full of red berries and black cherries. Of all the Red Diamond wines I tried, it is by far my favorite. Pairing: This is a very versatile Pinot Noir and pairs with a variety of foods. It is a great complement with everything from pan-seared scallops, tomato-basil pasta, chicken, pork tenderloin or even wild game. This Merlot is has a full flavor of blackberries, cherries and plums. The fruit is complemented by notes of spice, toasty oak and soft tannins. Pairing: This merlot pairs well with foods like pork tacos or grilled tuna steaks. It is also a great companion for vegetarian dishes like grilled Portobello mushrooms or pasta with tomato sauce. This Shiraz is made of ripe red fruits and luscious raspberry jam. You will find hints of clove and a touch of Orange scented honey. This was Gabe's favorite of the Red Diamond family. Pairing: This fruity and peppery wine is perfect with American BBQ and short ribs. It also pairs well with spicy and salty food such as Italian sausage, pasta, pizza and chili verde, chicken mole, fajitas, and burritos. This Spanish Red Blend offers aromas of blackberries and hints of dark chocolate. On the palate, bold flavors of black fruit meld with oak and ends with a silky smooth finish. 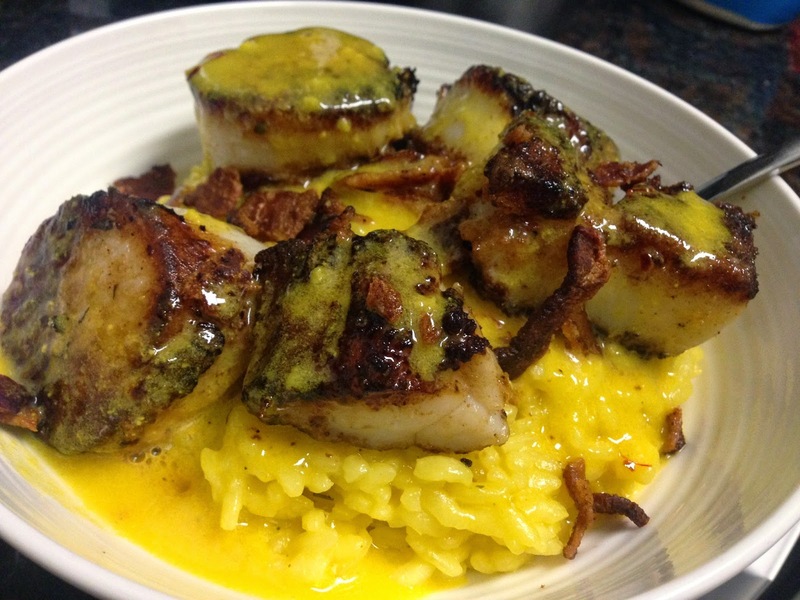 I paired the Pinot Noir with a recipe I have been dying to try - Saffron Seared Sea Scallops. It was a perfect companion to the light Pinot. Prepare your lemon saffron wine sauce. Recipe here - and I used the above mentioned wine in place of sherry. Cook your bacon in a cast iron skillet. Remove the bacon but reserve grease. After your scallops have been dried from the milk bath, dust them with flour. Place the Scallops in the hot bacon grease. Sear for 3-4 minutes each side depending on the size. Do not over cook. Place the scallops over the Risotto and top with the sauce. I also placed the cooked bacon I made for the scallops on top. It gave it a delicious crunch.